Did a short test to see how the 2014 1.8ltr Maf sensor diameter with the 2.5" Spectre insert would do against the stock 2015 Honda Fit maf sensor diameter housing. Did two runs on the same strip of road, started on same place on the road. Temperature was between 40-42F. Mods are below in my signature and gas used is 92 octane. I had to use 92 octane as the timing retarded a lot while using the Civic maf sensor like this before. Did two runs with the Civic maf housing, changed the maf sensor into the stock Fit maf sensor housing and did two more runs. I'm going to list 8 results of each of the 4 runs. I expected the Civic maf test to read lower Maf g/s since it is slightly larger diameter. I also expected to run leaner but with no detonation due to the 92 octane. I'm surprised at the horsepower/torque and time difference though. Was hoping for better than stock but this is what it is. Some I'm going to conclude that enlarging the maf sensor section directly around the maf sensor is not worth it unless the ECU can compensate for the extra air coming in. Power/Torque will be lost due to misreading at wide open throttle. More air definitely is getting in because you can see it with the leaner air fuel ratio but despite slightly enlarging the diameter with no detonation, power was lost some. In the meantime, another test is due where I ran with the two Spectre inserts inside, which reduced the Civic maf to a tiny bit smaller than stock. Air/Fuel ratio was slightly richer than stock. However, right between the maf exit and throttle body inlet, the coupling on the maf opens up wider. My 60ft time dropped slightly but my 1/4 mile trap speed on average was a fraction higher. My 1/4 mile time was a fraction worse though. At any rate, the stock maf sensor is staying in for now. Glad to see some numbers showing me what is going on. Sorry if this seems like a lot of info. I'm no engineer or tuner. I'm just looking at what is in front of me and reporting. Last edited by Myxalplyx; 10-20-2014 at 06:50 AM. This is potentially very good news. A gentleman sent me the maf calibration map from his Flashpro, for the 2014 R18 Civic. I have just made new file in Ktuner and put in all the numbers in the map so that the maf sensor reads properly with the larger Civic maf diameter housing. 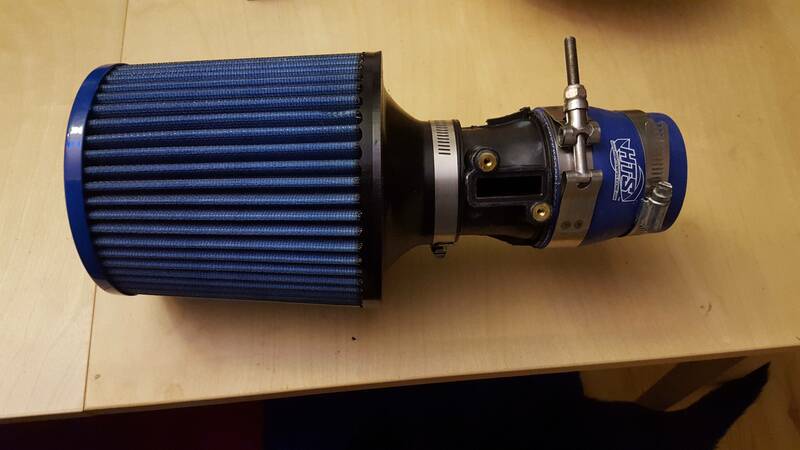 Tomorrow, I will be changing out my homemade intake to support the larger 2014 Honda Civic maf housing along with a larger air filter. I'll be doing some moderate driving then datalogging some full throttle runs to test for knocking. If all goes well, this is good progress. I don't know what to expect. So far so good. Here is the post where the guy put up the file for me. It is post #12. I've just had the piece sitting and waiting for this day to come. 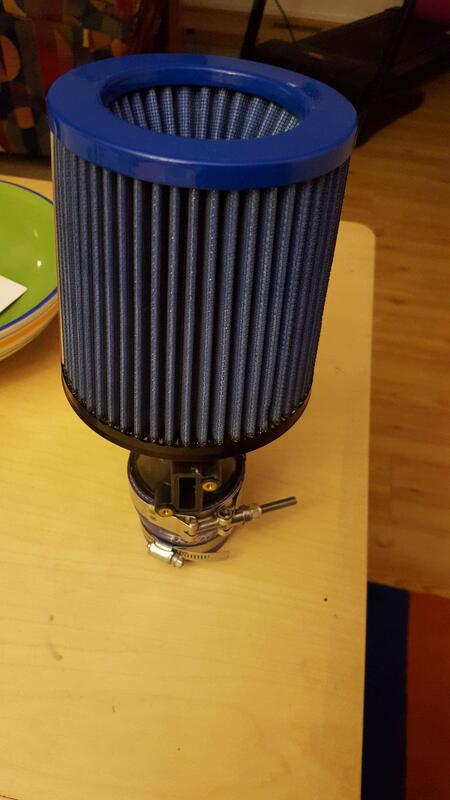 I had added a new, larger S&B air filter with it since I needed one with a larger opening. Last edited by Myxalplyx; 03-13-2016 at 10:16 PM. I have been running with the larger maf for about a month now. The maf map for the larger maf sensor was redone from scratch (Tuned with Ktuner, by SpeedFactory Racing) and it is running great with it. Air/fuel ratios at full throttle is around 12.7-12.9. Here is some general information. Take it with a grain of salt. With the stock maf sensor and short ram intake, I did five 1/4 mile runs on 3/12/16, temps 53F. Afterwards, with only the larger maf sensor installed and air/fuel ratio tuned, I did five more 1/4 mile runs on 4/8/16, temps 50F. Here were the results. So is it worth it? You'd have to decide. I just wanted to get this out there in case someone is interested in doing this in the future. Last edited by Myxalplyx; 04-30-2016 at 10:53 PM.